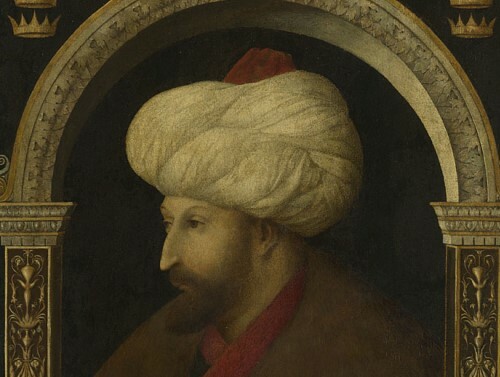 On 16 January 2019 the Islamic Art and Material Culture SSN and the SSN European Paintings pre-1900 held a collaborative Study Day at the National Gallery to explore the depiction of Eastern objects in the National Gallery’s exhibition Lorenzo Lotto Portraits and additional examples from the wider Renaissance collection. After a welcome by Dr Mary Hersov (National Gallery) and Dr Rebecca Bridgman (Curatorial & Exhibitions Manager at Birmingham Museums and Chair of the SSN Islamic Art & Material Culture) Professor Deborah Howard introduced the topic of the Eastern Mediterranean in Italian Renaissance art. A recording of this talk will be available via this website shortly. 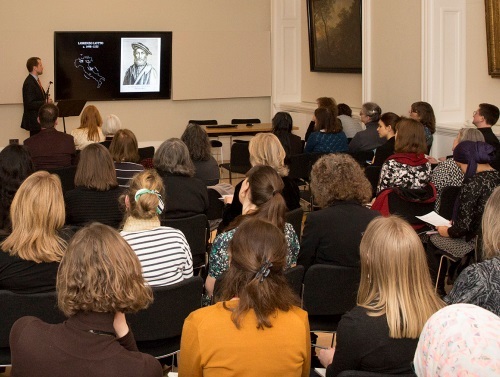 Dr Matthias Wivel, Curator of Sixteenth-Century Paintings at the National Gallery, gave an overview over the life and work of Renaissance painter Lorenzo Lotto and the concept behind the exhibition Lorenzo Lotto Portraits , which delegates were then able to explore. A recording of this talk will be available via this website shortly. A curatorial introduction to the exhibition is also available via the National Gallery’s YouTube channel here. After the opportunity for more informal networking over lunch, Professor Anna Contadini and Dr Caroline Campbell accompanied the group to the Renaissance collections in the National Gallery’s Sainsbury Wing. 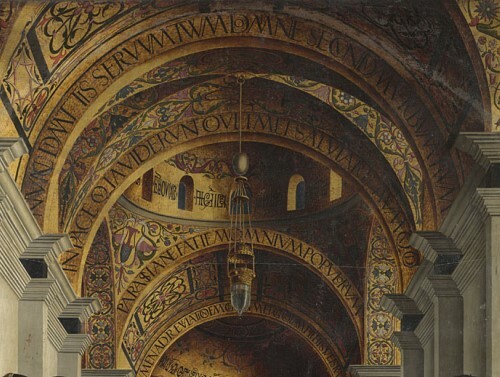 Making the transition from entire objects, such as ‘Lotto carpets’, discussed in the morning to the extrapolation of details, the speakers highlighted the displays’ intention of making connections and developing narratives and drew the group’s attention to pseudo script evoking Islamic ornament visible on the Virgin’s veil in Duccio’s early 14th century triptych The Virgin and Child with Saints Dominic and Aurea (NG566). In front of Marco Marziale’s The Circumcision (1500; NG803) Anna Contadini and Caroline Campbell explored details such as inscriptions visible in the cupola, the patterns visible on the priest’s robe and headgear, the striking large lamp of a type predating Islamic examples but still used in Turkish mosques today, the pomegranate motif on the robe of the man on the far right and the patterned textile placed underneath the Christ Child. A delegate pointed out that the latter detail sends a clear visual message for Muslims today and evokes the traditional celebration of the birth of a male child. In a final discussion the multiple re-purposing of motifs depending on context and of the ‘staging’ of Islamic objects to help local audiences understand them and to acknowledge diplomatic gifts was touched upon. Following the discussion of Marziale’s painting delegates were invited to continue conversations in smaller groups in front of other examples from the Gallery’s Renaissance collection and to finish the day with a complimentary visit to the exhibition Mantegna & Bellini. Caroline Campbell’s curatorial introduction to this exhibition is available on the National Gallery’s YouTube channel here.